Scales can be our best friend, or our worst enemy! You know how it is…as long as the numbers are reading in our favor, we’re pleased as punch… happy as can be! But ohhh… let those numbers jump UP or not move at all for a while then it’s ‘dooms day’ and we’re ready to throw the scale (along with any hope of losing weight) out the window! When you’re working towards achieving your health and weight loss goals, it’s NOT a good idea to weigh in on a daily basis. It’s tempting to do so, I know because I do it too; but my own personal experience as well as some of my research has shown that it’s not such a good idea. Why? 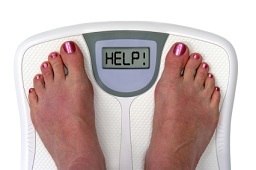 As your body is going through changes and making adjustments, your weight will tend to fluctuate. So don’t judge the success of your regimen and efforts solely by the numbers on the scale but instead, also gauge your success by factors such as: how differently your clothes fit, using a measuring tape to determine how many inches are being lost, how you feel (energy levels up, not being as winded when performing certain tasks, etc. ); sleeping better, complements from others! It’s best to set a weekly (or even bi-weekly) “Weigh-in Day” where you do your weigh in (always weigh yourself either naked or in nothing more than underwear and FIRST THING IN THE MORNING before you’ve consumed any food or beverage, even water), you take your measurements and if you have the ability to do so, measure your body fat percentage. Keep a chart of some sort so that you can document your results each time and see how you’re progressing or regressing and pinpoint specific things that may or may not have transpired to have an effect on your results. But the important thing is to, again, try to refrain from weighing yourself every single day, no matter how tempting it may be to do so!